One of a group of 4 by. TIMOTHY MARWOOD - who has works in several museums. In UK & USA & elsewhere , he created the artwork for about 30 years. THIS IS THE ORIGINAL - it was then scanned & printed in a comic - but THIS is the original , unique drawing. PLEASE NOTE - I photographed these in good sunlight - so the "clever " camera made the background blue - it is White / Ivory card. I have NO IDEA why it looks pale blue! It is posted out in Timothy's original mounts & measures approx. Posted VERY securely , each one is irreplaceable & a great part in English Comic history. I had the honour of purchasing the entire collection by Timothy when he moved house, he signed each of the 3000+ pieces of artwork and told me of the 3000 there were probably about 100 in colour and the comics were coloured by computer which was cheaper for the publishers. 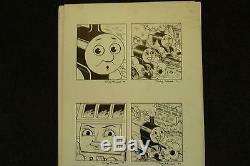 Since 1984 Timothy Marwood has been the sole illustrator for both of Thomas the Tank Engine and Friends comics produced by Marvel & Redan publishers. The fame and popularity of Thomas the Tank Engine and Friends dipped in the 1970's but then in 1984 the BBC launched him on Television and he has never looked back. A large part of this is due to the exceptionally fine and accurate work of Timothy. His other work includes Rosie and Jim, Enid Blyton The Famous Five, Enid Blyton's The Secret Seven and also Thunderbirds. When not painting or drawing for the comics his pleasure comes from painting marine scenes. Your Picture was used at the Very Beginning of the entire success story of Thomas & friends. His work is in the collections of. The Children's Museum of Denver. The Childrens Museum of Houston. The Children's Museum of Manhatten. The Omaha Children's Museum. The Childrens Museum of Singapore. St Bride Foundation London- THE Printing Museum. 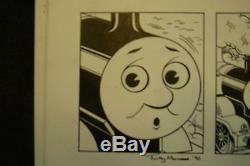 The item "Original drawing 4 THomas the Tank Engine THOMAS smiling signed early 1995" is in sale since Friday, October 28, 2016. This item is in the category "Art\Art Drawings". The seller is "brandlergalleries" and is located in BRENTWOOD. This item can be shipped worldwide.